Rose City Reader: Happy Veterans' Day! Happy Anniversary! Happy Veterans' Day! Especially to all my family and friends who serve or served in the military. This is also our 10th wedding anniversary. We got married on November 11, 2000. Our marriage "marches with the years" so we always know which anniversary it is. The traditional 10th anniversary gift is aluminum. Aluminum? Is veterans day the same as rememberance day here in the UK? With people wearing poppies? Sam -- Yes. Veterans' Day is the same as Remembrance Day or Armistice Day (because Germany signed the Armistice ending WWI on Nov. 11 at 11 am). We don't wear poppies here in America, although I like the idea of that. We actually do wear poppies here in the U.S. too. The American Legion and VFW members typically hang out in front of stores, etc. and hand 'em out. They are beautiful little hand-made paper poppies. I always go find one for my lapel on Veteran's Day. 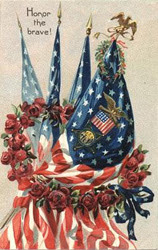 My family for several generations, back to the Civil War, has served, including myself. My oldest boy is career Army, and has done several tours in Iraq and Afghanistan. Happy anniversary! I used to see red poppy pins on Veterans' Day, but haven't seen them in some years. Hope you had a lovely anniversary! We got married exactly one week after you, so our 10-year is coming up next Thursday. Happy anniversary--it's nice to march with the years, I have to do the math sometimes to remember which anniversary we're up to!